A second page of Ford Model Ts. Homepage. This page: A further selection of images showing Henry Ford's ubiquitous Model T.
Model T Ford tourers - Page 2. 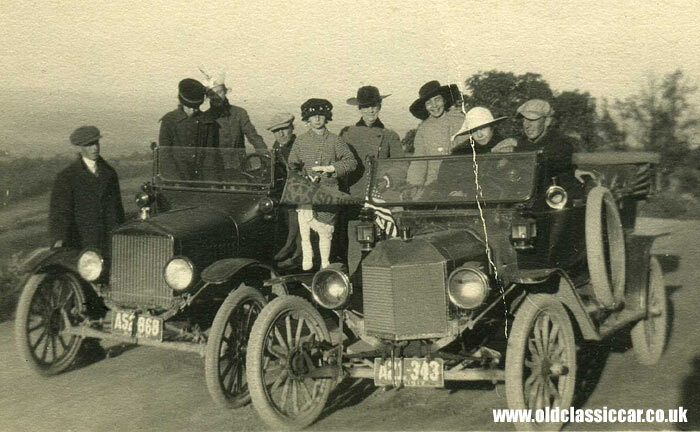 This is the second page within the photos section to focus on Ford Model T tourers, the first set can be found on this page. Other variants can be found elsewhere in this section of the site. An unusual humorous postcard, featuring a rhyme about Model T Fords, can be seen here. 1. 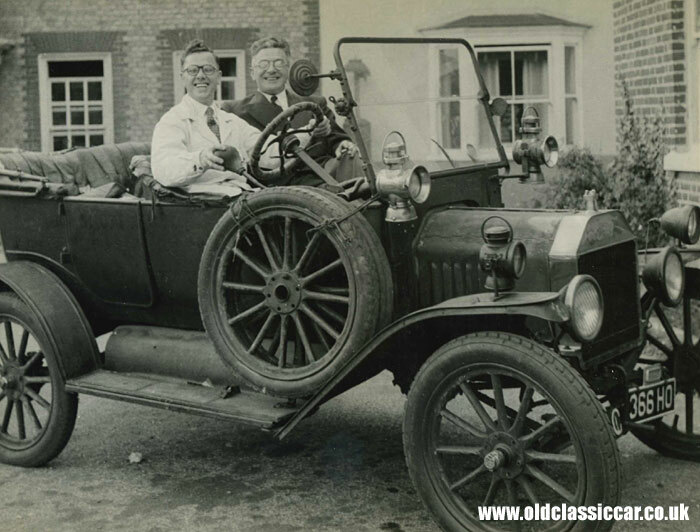 Two cheery chaps in a Model T.
To open this page, a black and white shot of two smiling gents sat in a slightly modified Model T. At first glance it looks just like any other tin lizzie that you'd see at a show, or perhaps being driven by Laurel and Hardy in a '20s flick. This one though looks to have received a few updates along the way - note the twin spare wheels and tyres, strapped together and secured to the windscreen support bracket. There's no shortage of illumination either, note the lamps fitted to the scuttle, and also the mis-matched pair bolted to the front wings. Judging by the numerous oily patches on the driveway, old cars were regularly parked outside these houses. The HO registration letters were used from October 1917 to October 1922. It has been suggested that the plate could actually be a trade plate, although that'd have a red background, whereas the plate in view appears to have a very dark - black? - background to it. The Ford looks to be a few years old in this photo, the paint is very faded indeed. Just visible on the rear door is the word "Ford", with further illegible writing below it. Was it being readied for an epic trip perhaps? or had it been used as a publicity item at some point? I guess the answer to these questions will remain a mystery, unless anyone recognises the beaming duo on board..? 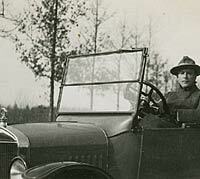 "The two new Ford T photos are both very interesting. 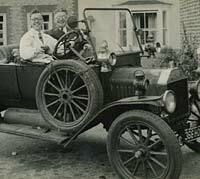 The first one of the two bespectacled gents in a car, suggests to me that the photo is much much later than the car, in fact I would guess it was taken in the 1950's or later. I feel that the car has been 'dressed up' for some event or outing." "The illumination, apart from the headlamps is a horrible mix and definitely non-Ford. The bulb horn is a non-original accessory. This is the third photo on the site showing T's with non-demountable wheels carrying complete or semi-complete wheels as 'spares'. Those wheels are not designed for that sort of application. A flat tyre was repaired with the wheel in place on the car. I believe that carrying such spare wheels, suggests that the owner or driver is used to more modern vehicles where one does actually carry a spare wheel. The dress of the gents looks quite out of period. The car itself is pre 1917." 2. 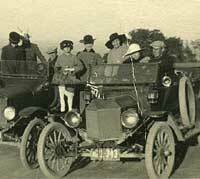 A group outing in two Model Ts. Next a shot that came from the USA. Two Model Ts are shown, the example on the left looking totally standard, whereas the T on the right sports an aftermarket replacement radiator. A great variety of parts were made available by outside concerns, each offering the Model T owner the chance to personalise his or her Ford, at a time when they were a common sight on the dusty roads of the US. This was probably the first example of a large new industry being born, designed to enable motor-car buyers to personalise, or improve, their car. Many such modifications and improvements are featured in contemporary US motoring magazines, and I hope to feature some of these on the site soon. Both the cars below have 1917-date registration plates, or "tags". Regarding this photo, which I think was taken in the US, Dane adds: "The car on the left is what a 1917 T should look like. The one on the right is probably about 1913. I have recently seen another photo of a T with an after-market 'V' radiator. Might be the same car, but I can't remember where I have seen it. It is interesting that both of these cars are LH drive. Can anyone recognise the flag that the little girl seems to be holding. It has the letters 'S' and 'W' intertwined. That might be a clue to who these people are." 3. An early Model T in Canada. 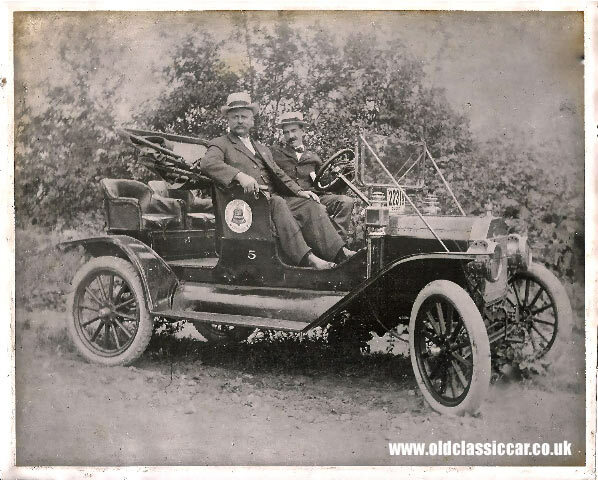 Brock emailed this next photo over from Canada, it shows his father Charlie Field sat in an early-ish example of the Model T. The screen supports suggest a date of 1912 or earlier, and the overall style is very similar to the seventh photo on this Model T page, although the car in Brock's photo appears to be missing its doors. 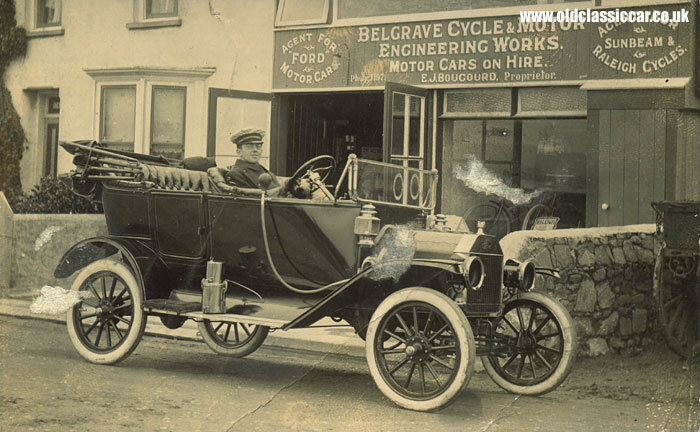 He believes that this is one of the first cars purchased by Bell Telephones - note the bell symbol painted on the side of the Ford's bodywork, and the number '5'. 4. Belgrave Cycle & Motor Works. 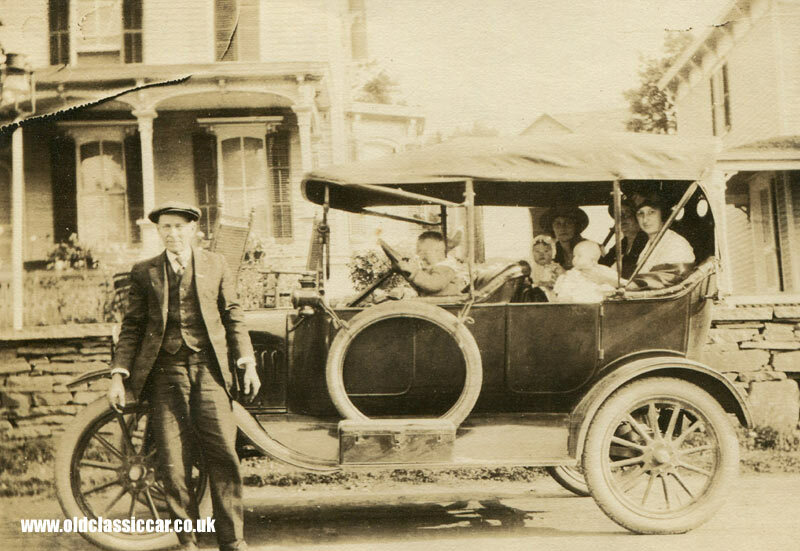 Whereas most of the Model T photos I have tend to show owners with their cars, this is unusual in that it shows a Model T outside a Ford sales agency, with possibly the proprietor of the business - E.J. Bougourd - sat behind the wheel of a T outside his premises. 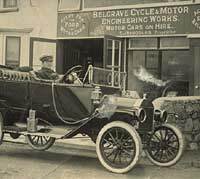 The Belgrave Cycle & Motor Engineering Works - to give the business its full title - looks to have been established in quite a suburban setting. It probably started out in life selling and repairing bicycles, as was often the case with the early car sales agencies. Signs for Sunbeam and Raleigh cycles are quite visible, as is notification that the Belgrave Works could also supply Ford Motor Cars. Within the shop window are a number of Raleigh bicycles on sale, and just visible to the right is a horse-drawn cart. I couldn't at first find any reference to a firm of this name, but a search for a Mr E.J. Bougourd brought up a reference to the Belgrave Motor Engineering Works on Guernsey, set up by brothers Alf and Eddie Bougourd. This confirms that the brothers started out in bicycle sales from a shop on Vale Road before branching out into the supply of Fords, and their move to Richmond Corner. 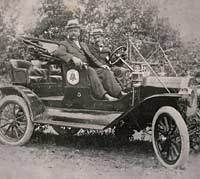 The first Ford was imported as a kit of parts in 1911, an order for just one car to give the Bougourd Bros a chance to see whether it'd create sufficient interest to justify the import and assembly of new-fangled motor-cars to the island. 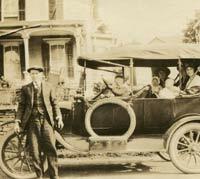 Interest grew rapidly and the brothers were regular purchasers of the Model T, their "assembly line" bolting together Model Ts for the locals on Guernsey. Alf Bougourd spent some time in Detroit, to assess and better understand the new market that the brothers had entered into, and in later years the business would expand to the supply of newer Ford models. Whether the Model T shown above was parked at Vale Road, or Richmond Corner, I'm not yet sure. 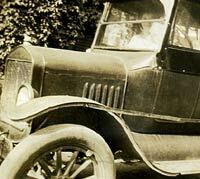 The car could well date to 1911, could this un-registered Model T have been the first one they imported and assembled? 5. 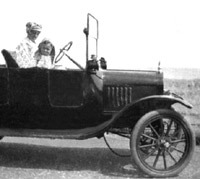 A Model T tourer in the USA. 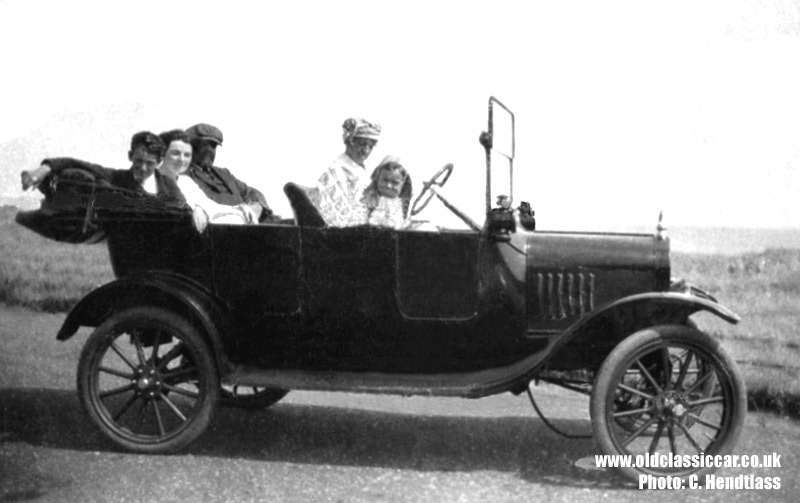 Tucked away in a collection of photos sourced in the States was this one, featuring a LHD Model T tourer accompanied by three ladies in 1927. The painted radiator and profile of the bonnet suggest a late-ish example of the breed. This car has the folding roof in the raised position, and most of the sidescreens in place. Quite what the thin metal (?) strip attached to the front and rear wings does is anyone's guess - perhaps large items were regularly carried on the Ford's running boards, and the strip simply helped keep them in place? 6. A Ford Model T in Kent, 1921. "The photo is labelled 'August Bank Holiday, 1921 at home' - home was Canterbury, Kent and the passengers are my mother and her parents and siblings. 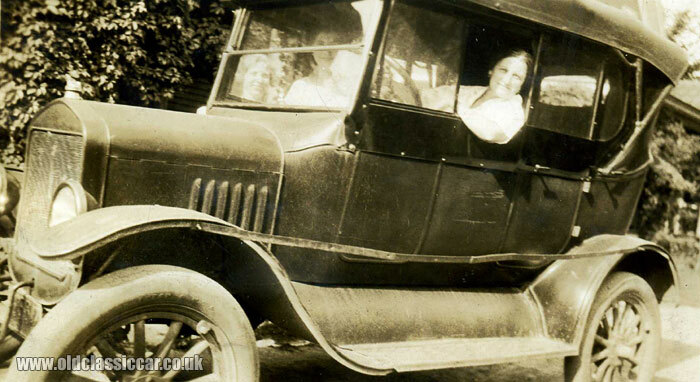 This car was used up until 1929 for a yearly trip from Canterbury to Cornwall, and was always driven by my grandmother Elizabeth Lander (my grandfather Arthur apparently never drove a car in his life). According to my mother, Elizabeth was the first woman in Canterbury to get a driver's licence. Unfortunately I don't know the registration or the fate of the car, but I still have the tin trunk that was attached to the back on its long trips." 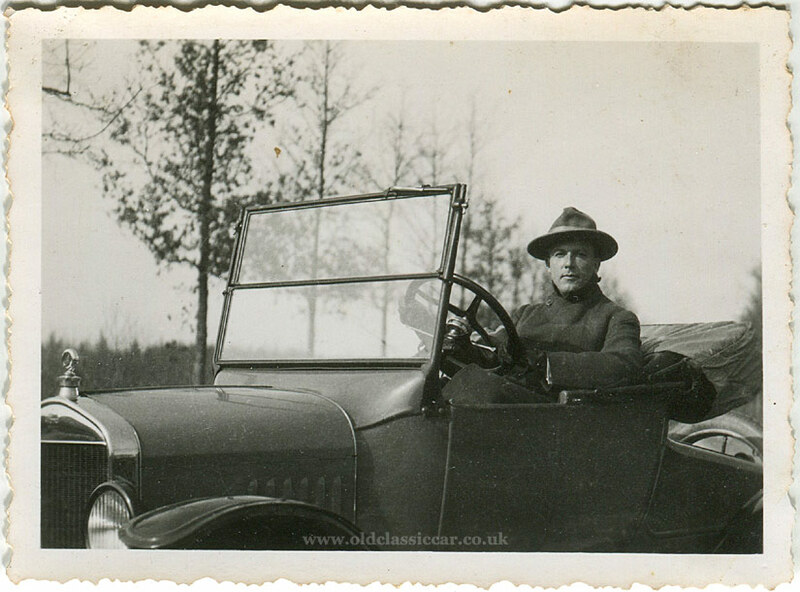 Photos of vintage Fords continue to turn up, the next example is a side view of a tourer, with its roof in the raised position. Drivers seem to get younger every day, and the young lad behind the wheel of this Model T is a perfect example. In the rear compartment, two well-dressed young ladies, accompanied by a lady of more mature appearance, clutch on to a pair of very young children. An elderly gent, dressed appropriately for a drive out in a vintage motor, stands alongside the car. Note the toolbox attached to the running board, and a spare tyre tied to the base of the windscreen frame, and part of the hood frame. Also note the two small oval windows let into the rear of the hood cover, a feature seen on some but not all of the original Model T photos I've come across. Three years have passed since last this page was updated, so its high time for another period photo of a Model T tourer. 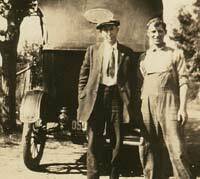 Here, two gents of the 1920s pose behind a Model T, its roof raised. This example has an oval rear window installed into the hood fabric. 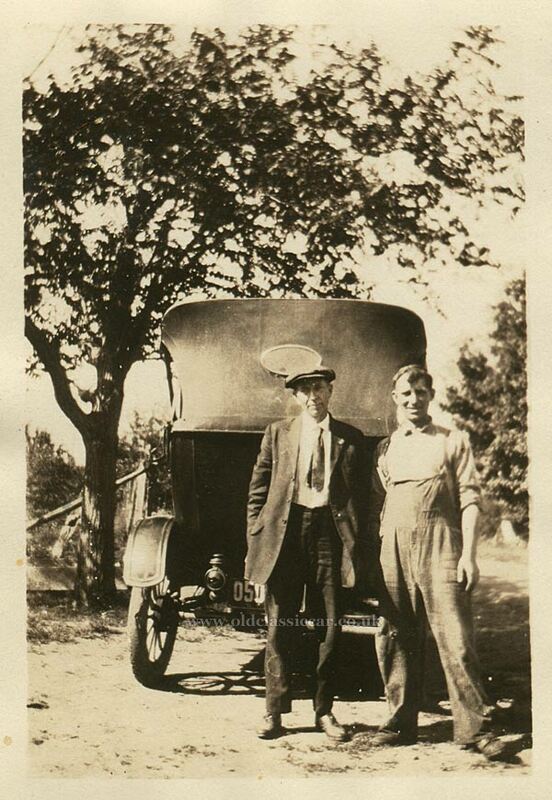 The younger chap on the right, wearing dungarees, may well have done work on the car for its owner, the hatted gent on the left. He's not dressed for wielding any spanners, that's for sure, and sports headgear not unlike my own. He's obscuring part of the licence plate, so identifying the location of this view won't be possible unfortunately. Great picture nonetheless. Generally, I prefer to include photos of cars in the period that they were either new, or at least still in regular use and a common sight. Saying that, many of the earlier cars are now so old that for most of their lives, they've been considered "collectors" cars, rather than just old bangers. This is the case with the next photograph. 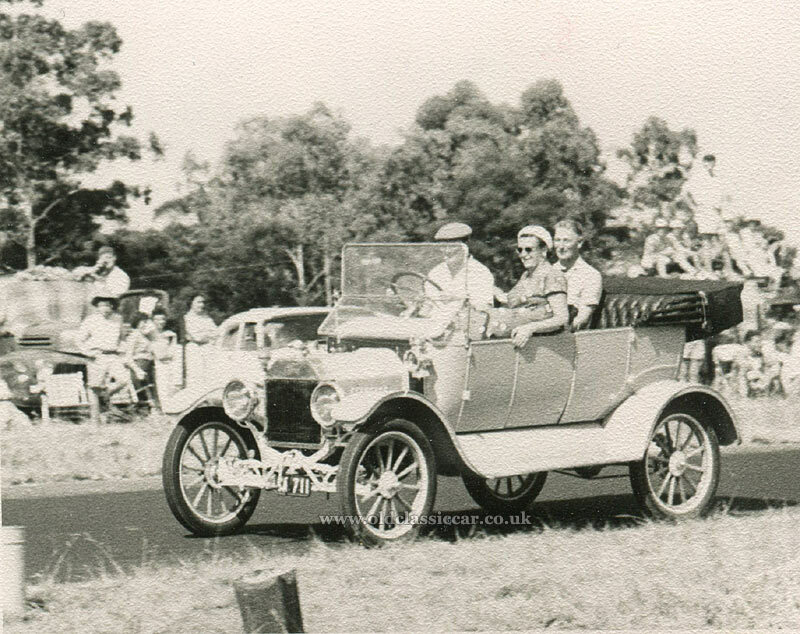 It shows a brass-radiator Model T taking part in a veteran and vintage car parade, held at a motor race meeting in Pietermaritzburg in South Africa, during 1959. Of advancing years by the time, the Model T was already looked upon as a historic vehicle, even though the old-car movement was nothing like as strong, or well supported, as it is today. A crowd of onlookers watch as the venerable Ford trundles by, with its driver and two passengers lapping up the admiration of the crowd. 10. 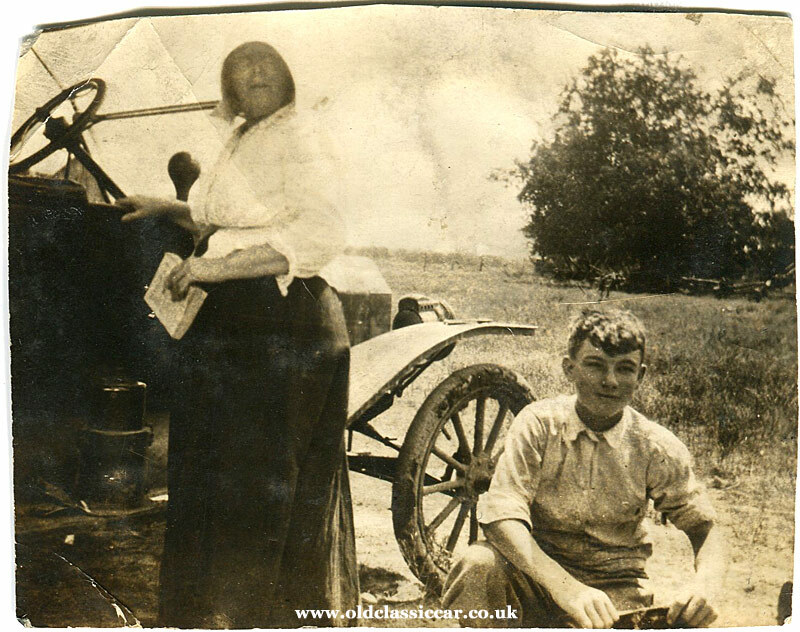 Young boy and lady with their Model T.
This old photo remains in reasonable condition, despite its 100+ years in age. It turned up in a batch of images bought from the USA a few years ago. 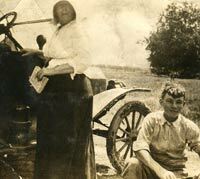 A young lad is shown sat on the grass, while a lady more advanced in years looks beyond the photographer, while leaning on the passenger door of an early Model T. One of the acetylene headlamps is clearly visible, as is the acetylene generator mounted on the running board. The generator contained a lump of carbide, onto which a small metered amount of water was dripped, creating gas used to illuminate the lamps. 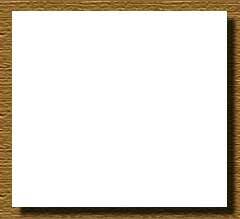 There are no notes on the reverse of this photo. Another photo in the same batch, also in sepia and dated to 1928, mentions "Cumberland District" - quite likely a reference to Cumberland County, in Tennessee - perhaps the location of this Model T scene. 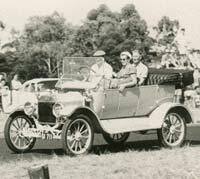 Other than being printed on Agfa-Lupex paper, and the car being a LHD Model T tourer, little else is known regarding this old photograph. The chap behind the wheel is wrapped up in warm clothing, including gloves, so the weather must have been less-than-balmy. Saying that, driving a vintage tourer in anything but warm weather can err on the chilly/draughty side. There appears to be an aftermarket item fitted to the side of the steering column, beneath the wheel, which may well be a speedometer that takes its drive from one of the front road wheels. Return to classic car photos - Page 11.